The recent adaptive restoration of Graves Hall at Hope College has earned honorable mention in the Grand Valley American Institute of Architects (GVAIA) 2010 Honor Awards program. The award was presented during a ceremony on Saturday, Sept. 25, held in conjunction with a reception at the 38 Commerce building in Grand Rapids that recognized projects by area architects in several categories. Graves Hall was recognized for Historic Preservation/Adaptive Reuse. Dedicated in 1894, Graves Hall re-opened in August 2009 after a year-long, $5.7 million, adaptive restoration that has emphasized a return to the building's original character while updating the 19th-century landmark for use in the 21st. The architect was Philip M. Davis of Fishbeck, Thompson, Carr & Huber Inc. of Grand Rapids. Construction manager for the project was Lakewood Construction Inc. of Holland. 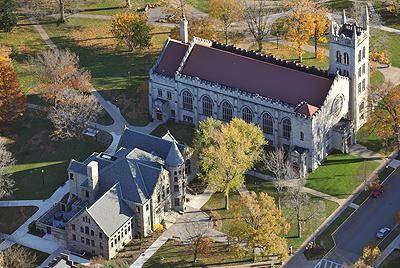 Graves was constructed as the college's chapel and library, but ceased serving as first one and then the other when Dimnent Memorial Chapel and Van Zoeren Library opened in 1929 and 1961 respectively. Renovations in 1962 and 1980 reconfigured the building for new use, but at the expense of much of its beauty. In both updating and restoring the historic structure, the latest work was informed by original blueprints as well as photographs and even living memory. Remade were the distinctive art-glass windows that were once a fixture in Winants Auditorium, a connection to the space's original use as Hope's chapel but removed in 1980 due to their deterioration. As when the building opened in 1894, the second floor features four large classrooms, the varnished wooden doors and wainscoting without suggesting the classic elegance of a bygone era. The main staircase, isolated behind metal doors in the 1962 redo, again greets visitors to the main lobby. As prior to the restoration, the ground floor of the building continues to house the Upward Bound and CASA programs, as well as the Schoon Meditation Chapel, all in improved space. A major new addition - built of stone to match the rest of the building and facing the Pine Grove - includes an elevator that provides access for the first time to the top and ground floors for those with mobility impairments. Other features where the library stacks once stood include an additional classroom and the "Presidents' Room" conference room featuring portraits of all of Hope's presidents. Additional amenities undreamed-of when the structure was built include wireless Internet service and wiring throughout for access to the complete array of technologies that exist in support of education and air conditioning.